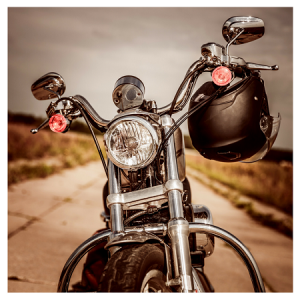 5 Common Causes of Motorcycle Crashes | Hinman and Peck, P.C. The thrill of the open road on a motorcycle can be exhilarating. Motorcycles are a popular mode of transportation and recreational riding. However, as with the use of any vehicle, there are inherent dangers and risks in operating one. By their design, motorcycles offer much less protection to the rider from both the weather and other drivers in the case of an accident. Take these risks very seriously and always wear appropriate safety gear including a helmet when riding a motorcycle. To reduce the chance of sustaining serious injury or even death, it is also crucial to understand the most common causes of motorcycle accidents. Vehicles making Left-Hand Turns. According to the National Highway Traffic Safety Adminstration, more than 40% of accidents occur when a motorcycle is going straight or passing a vehicle and a vehicle driver is making a left hand turn. Because they are smaller and provide less visibility than other vehicles, drivers often don’t see motorcycles when making these turns. Motorcycle Lane Splitting. Lane splitting is the use of a motorcycle in between lanes of traffic, usually when cars are stopped in traffic. Because of the close proximity to other vehicles, with little ability maneuver and the fact that drivers don’t anticipate a vehicle will be passing, this situation is an inherently dangerous one. Speeding and Alcohol Use. Speeding is a prime cause of accidents for drivers on motorcycles. According to the NHSTA, of 34% of fatal motorcycle accidents in 2013, motorcyclists were speeding. In the same study, it was found that in 28% of fatal motorcycle crashes, the rider exceeded the states blood alcohol content limits. Speeding and alcohol use never mix with driving, but motorcycle riders are offered little protection and accidents will likely result in serious injury or death. Fixed Objects. Motorcycles hitting fixed objects, including guard rails, trees and telephone poles account for 25% of motorcycle accidents. The rider will typically be thrown far and hard in fixed object accidents. Road Hazards. Because motorcycles are smaller and less stable than other motor vehicles, road hazards such as potholes, animals and slick pavement increase the risk of potential accidents. If you enjoy getting out on the road as a motorcycle rider, it’s important to take a motorcycle safety course and ensure you are appropriately licensed. Motorcyclists are at much greater risk than other drivers on the road, but being aware of the most common causes of accidents and taking steps to reduce or avoid extra risk is paramount to rider safety. If you or a loved one has been injured in a motorcycle accident, it’s imperative that you seek counsel from an experienced personal injury attorney, car accident attorney and motorcycle accident attorney in order to protect your rights.